After my successful Windows 8 installation just minutes ago, the first thing I checked was its compatibility with Legacy Family Tree. It runs perfectly! No problems at all. I have not yet done any customization. On the left are the default tiles, and on the right are my most popular apps/programs. Clicking once on the Legacy icon, Legacy opened as expected. This is going to be fun! I'll keep you posted on what I learn. 1. At http://windows.microsoft.com/en-US/windows/download-shop, I clicked on the Buy Windows 8 button. It downloaded a small file which launched the compatibility wizard. 3. It showed the list of what was compatible, and what was not. 4. It asked me what files I wanted to keep. Of course I selected the first option. 5.Next I was presented with the opportunity to purchase Windows 8 Pro. At $39.99 it was a bargain compared to previous upgrade prices. 9. They accepted my credit card, and presented me with my Product Key. I clicked on the View Receipt link and printed it. I was also emailed a copy. 10. Then it began the large download. It's now at 96%, with 28 seconds to go. I'll keep you updated on what I learn today. If I do not write another article in the next couple of hours, it's because I either 1) uninstalled Windows 8, 2) really liked it and am still playing, or 3) went to my 5th grader's awards assembly at the school. I know I'll do number 3, but am unsure about #s 1 or 2. What about you? Have you installed Windows 8 yet? 9:25am Update...that seemed to do the trick. It is now in the process of "getting files ready." OK, I guess I won't be able to write anymore until installation is done. See you soon! 10:46am update - just got back from my son's award's assembly. He got straight A's and made the Principal's List! When I returned home, the installation wizard asked me a few questions about my favorite colors and preference selections. I'm now working with Windows 8! It has both a desktop mode (which looks identical to Windows 7, but without the Start menu) and the Tile mode. I'm nervous for the Tile mode, mostly because it's so new and different, but am looking forward to exploring. So far so good. Tell us about your experience below. Have you made the upgrade yet? Why or why not? The major new upgrade from Microsoft, Windows 8, will be available for your computer or tablet starting Friday, October 26, 2012. While I am usually first in line to upgrade to the latest and greatest, I may hold off a little while on this one. But again, I might not. Windows 8 is so completely different than what we are used to - it does not even have a Start button anymore. And since it is optimized for computers and tablets with touch screens, many early testers recommend to stick with Windows 7 if you do not have a touch screen or tablet. Legacy Family Tree works well on Windows 8 and Windows 8 Pro. It does not (now) run on tablets running Windows RT. For a comparison of the three versions of Windows, click here. Or take a tour of Windows 8 here. Having said all this, you will probably find me at the computer store early Friday morning. What about you? Are you taking the plunge, or will you wait for a while? I know what you’re saying…“It’s too early for Christmas!” or “I can’t believe the holidays are here already!” I often feel the same way around the end of October and I tend to get cranky when I see television commercials advertising the holiday gift-buying season or hear Christmas songs on the radio. During the holiday season I also feel pressure to not only find unique gifts for family members, but to also share family photos and my genealogy research. So I’ve found a few solutions that take some of the pressure off and help me enjoy the season with my family and friends. Holidays Are Closer Than They Appear! Before getting busy with the “crafty” or creative part of the solutions, I have to scan those photos sitting in the boxes and albums. I can’t put it off, otherwise I won’t have the digital images I need to create great gifts. I’m also scanning at the highest possible resolution on the Flip-Pal mobile scanner—600dpi. This ensures that the images in my gifts will be clear and really stand out on the items I’ll be creating. Over the past few nights I’ve been busy using my Flip-Pal mobile scanner to digitize my old family photos while I have watching television in my living room. I have been able to scan about 50 or so photos each night to create a library of content that I can then turn into a variety of gifts. Don’t delay! The process of going from scanned photo to great gift will take at least a week before you can even receive the item you create—and that’s if you work at lightning speed. Most people will need more time, so scan those photos now! 2013 Calendars: Create desktop or wall calendars with a different family photo for each month. Use your genealogy research to write a brief description about the people or places depicted in the photographs. Also, don’t forget to include those birthdates and anniversaries on each day! Christmas Tree Ornaments: What’s nice about photo ornaments is that they are brought out each year and bring back memories. As you can see from the photo above, I’ve scanned my family photos, mounted them on cardstock, and then, using a glue gun, I’ve decorated them with preserved cedar and dried rosebuds for a Victorian look. Wearables and Other Gifts: Online stores such as Café Press and Zazzle let you upload photos to create t-shirts, sweatshirts and more. Don’t forget that you can also create mouse pads, tote bags, buttons and even iPhone cases using those same photos. A nice aspect of using these online stores is that once the holidays are over, family members can go and order the items they want at any time! Printable Fabric: Local fabric and hobby stores carry cotton fabric that you can print with your ink jet printer, just like paper. It is colorfast and can make great wall hangings, throw pillows, or even a heritage quilt. Photobooks: The self-publishing concept has become so much easier by using sites like Lulu, My Canvas, Blurb and even superstore sites like Costco and Walmart. Upload your photos, select a template, a paper type and a binding format and you’re on your way to creating a memorable book. These ideas are just the beginning of endless possibilities for gifts using your photos scanned with the Flip-Pal mobile scanner. Need more inspiration? On Friday, November 16, 2012, at 2:00 p.m. Eastern Time ⁄ 11:00 a.m. Pacific Time, you can attend a live online presentation entitled 10 Ideas for Great Gifts Using Your Family Photos presented by Flip-Pal and Legacy Family Tree. Once a precious family photo is scanned using the Flip-Pal mobile scanner, you can do more than just send the image to friends and family or add it to your family tree. We will quickly cover how to scan an original and then print the scanned image for use in gift projects. A few of the ideas we will share using these prints include ornaments, sweat shirts, quilts, wall hangings and holiday decorations. This seminar will be packed with ideas and step-by-step instructions from these two creative individuals. We’ll also discuss how you can use various sites such as Zazzle, Café Press and even superstore sites such as Costco, Walmart and Walgreens to create calendars and photo books as gifts. 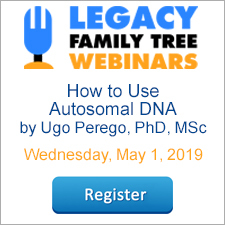 You can learn more about Legacy Family Tree webinars by downloading their latest flyer here. FamilySearch added 2.7 million indexed records and digital images to its growing collection, with a large portion being added to the Iowa County Marriages collection. The latest update to the Iowa County collection makes it 86 percent complete. The update includes 637,695 new images of marriage licenses and 1,623,576 new indexed records. Also of interest are the 198,938 new images and records added to the Dorset, England, Parish Registers collection and 428,000 Boston passenger lists for 1820 to 1891. Search these diverse collections and 3 billion other records for free at FamilySearch.org. Thanks to our new guest blogger, Lisa A. Alzo, M.F.A., for today's article! October is National Family History Month,* and a perfect time to discover your roots, or catch up on those family history tasks you’ve been meaning to work on. Although we’re already a couple weeks in, there are still plenty of days left. Here are ten great ways to celebrate. 1. Trace your family tree. Use the month to build, edit, or update your family tree. Legacy Family Tree software makes this task easy to do. 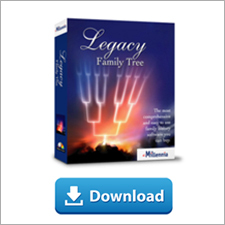 If you’re not yet a Legacy Family Tree User, download the free version standard version and give it a try. If you’re already using Legacy, explore its mapping features to track an ancestor’s migration, create any number of beautiful wall charts, or work on your source citations with the new Legacy SourceWriter™ to ensure proper formatting. 2. Try a new tech tool. Technology is always evolving and genealogists are finding new ways to integrate new tools and apps to help with research tasks. Explore a new app for your smartphone, or try out great cloud storage options like Dropbox. Take advantage of all that Google has to offer (Docs/Drive, Books, Translate, and more), contribute to a Wiki such as the one at FamilySearch.org, or build one of your own. To learn more, check out Thomas MacEntee’s Legacy Webinars available on these topics. 3. Make connections. No genealogist is an island, so the more you can connect with family members who may hold the answers to your family history questions the better. Blogs are a great way to reach out. In fact, they are often referred to as “cousin bait.” Find more than 2,800 genealogy/family history blogs at Geneabloggers. And don’t forget social media (Facebook, Google Plus, Twitter, Pinterest) to help you find long lost relatives and connect with other researchers. 4. Tell a story. Don’t be just a name collector, or fact curator. When possible, interview family members and research the historical context of the time period, and then try your hand at writing your family’s story. Don’t know where or how to begin? My Legacy webinars on “Ready, Set, Write: Your Family’s Story” and “Digital Writing Tools for Genealogists” can help get you started. 6. Go to the graveyard. Graveyards are really popular places in October thanks to Halloween. But don’t get spooked. If possible, visit your ancestors’ final resting places and photograph their tombstones. Using apps such as BillionGraves, or Resting Spot make the job much easier. If you are not able to physically travel to a cemetery, try searching the large virtual gravestones available on Find-a-Grave.com, or Interment.net. 7. Start a heritage craft. With the holiday season just around the corner, why not consider giving your loved ones the gift of family history? Starting now will ensure you finish in plenty of time. For example, wall charts are wonderful ways to share your research (watch the free Legacy Webinar on “Further Your Research and Unify Your Family Reunion with Beautiful Genealogy Charts” to see all of the great ways to display your family tree). Other ideas include creating a memory book, heritage quilt, or ornament—the possibilities are endless. For more inspiration, visit Heritage Crafts on Pinterest. 8. Search a different database. If you find yourself going back to the same genealogy databases or websites time and again, shake things up a bit and visit a new one. You can use a site such as TopTenReviews to view and compare a dozen of the most popular services (Note: not all databases are listed so you should explore others on your own or read the blogs of other researchers for more suggestions). 9. Prepare a favorite family dish. Craving some of Auntie Ann’s apple crisp, or grandma’s chicken soup? Family recipes and traditions help us to more deeply understand and connect with our heritage. If you have recipes that were passed down, pick one or two of your favorites and make them during family history month. If the recipes are handwritten on old recipe cards, scan them and use a program like Evernote to save and organize them. 10. Learn something new. Legacy Family Tree is offering several great Webinars during the month of October to help you with your research problems. If you can’t listen live, you can watch the recorded versions for a limited time afterwards, purchase past webinars on CD, and register for future webinars. It’s wonderful to have an entire month officially dedicated to the pursuit of family history. Use the ten suggestions above as a guide, and then come up with your own innovative ways to “show your roots” during October! We are proud to announce a new addition to our Legacy Family Tree product line: Legacy QuickGuides®. Each laminated guide contains four pages of valuable information covering a variety of genealogy research topics. Legacy QuickGuides are written by genealogists and family historians who are experts in subject areas. The first three are now available from our online store. In a New York genealogy state of mind? Looking for those elusive Empire State ancestors? The New York Genealogy Legacy QuickGuide contains useful information including a timeline of New York history events, tips on New York research strategy, a list of New York migration routes and more. Also included are over 140 links to websites and resources covering vital records, church records, census records, as well as general New York resources. This handy 4-sided laminated guide easily slips into a backpack or laptop bag for those genealogy research trips. Thomas MacEntee, author. This is also a perfect companion to Thomas MacEntee's Researching Your New York Ancestors webinar-on-CD. Click here to purchase for just $7.95. Are you a parent, teacher, librarian, genealogy society member or someone interested in sharing genealogy with children and getting them hooked? The Genealogy for Kids Legacy QuickGuide contains useful information including tips on getting started with a youth workshop, strategies for creating a workshop, workshop speaking suggestions, activities, groups to contact to engage the younger generation, and plenty of web-based and book resources to make your workshop the best it can be. This handy 4-sided laminated guide easily slips into a backpack or laptop bag for those genealogy research trips. Jennifer Holik, author. This is also a perfect companion to Maureen Taylor's Children and Genealogy in the Classroom webinar-on-CD. Most historical records have been created for and about men, making it more challenging to research and write about female ancestors. The Finding Your Female Ancestors Legacy QuickGuide contains useful information including best places to find maiden names, locate women’s history resources, and other key strategies for tracing your maternal lines. This handy 4-sided laminated guide easily slips into a backpack or laptop bag for those genealogy research trips. Lisa Alzo, author. This is also a perfect companion to Leland Meitzler's Chasing Women: Finding Your Female Ancestors webinar-on-CD.